One of the best results of gratitude journaling is the creation of the journal itself. The process of looking back on your old memories and moments can bring you just as many (if not more) happy vibes than the simple process of recording those moments. But what if you just want to view some random past moments? Sort of like a cookie jar with happy thoughts instead of carbs. There are a few key differences between the way a happiness jar and a gratitude journal work and the ways they can bring you joy. It's pretty easy to make a Happiness Jar when you already have (in some cases) hundreds of days of happy moments. So we found an empty corner of Happyfeed and added in our own Happiness Jar. 💎 Discovering hidden gems - The jar is completely random, so you're just as likely to see your first day as yesterday. ✨ Even more happiness - You aren't limited to how long you're willing to scroll now. Whenever you need a happy boost, your happiness jar is the perfect solution. 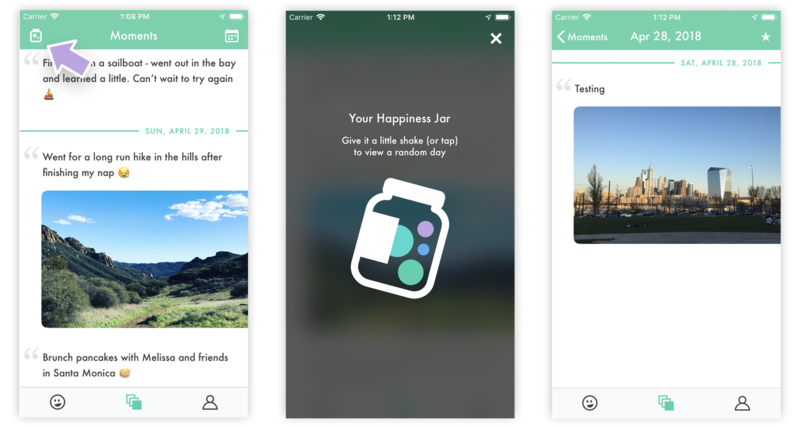 Note: New users will not see the Happiness Jar until they've had Happyfeed for 2 weeks. We just thought it was too boring when you only have a few days to randomly choose from. We think the "shake" gesture is totally underrated on your iPhone! So if you want to open up the Happiness Jar, you can also give your phone a shake on your history page. You can shake it again to see a random day. How you shake is up to you, but we definitely wouldn't discourage any full-body shakes to get yourself moving a bit 🕺. Everytime we build a new feature we can't help but immediately think how we could improve it. Wouldn't it be interesting to see where you were on these random days? How might we make this something you could share with the people who were part of that memory? So why did we build the happiness jar? It fits perfectly with the ethos of what we want Happyfeed to be: a place to escape social media and get to know yourself better. There’s a lot of power in learning what makes you happy and what made you happy in the past. Memories are so important in teaching us where we're going next. If nothing else, maybe you’ll see a photo that floods your brain with positive emotions. We like to say that “Happyfeed grows with you,” and that feels even more true with this new feature. More moments means more days to choose from in your jar. The more you use Happyfeed, the more likely you are to pull up a day you completely forgot about. Next time you’re feeling burned out on social media, give the happiness jar a shake!